Owning a recreational vehicle can give you the freedom to hit and enjoy the open road anytime you want. However, before going on a trip, it is crucial to invest in the best RV water hose and ensure that you have it on board. The best drinking water hose for RV is actually constructed out of materials approved by the government to be safe for use on drinking water. That said, you can’t expect your green garden hose to be helpful in this case as there is a chance that it is loaded with toxic and harmful chemicals. It is advisable to invest in the right RV hose as it actually plays a major role in your daily activities on the road. You can’t expect life on the road to be totally comfortable even with all the facilities that you have onboard if you do not have the most suitable water hose for your needs. With a good RV freshwater hose, you can use something to fill your vehicle with clean water. The problem is that water hoses for recreational vehicles now come in various types. This might cause you to find it really tricky to choose the right one, especially if you are still unsure what you should look for. To help simplify the whole selection process for you, I compiled some of the best water hoses ideal for recreational vehicles. You can pick one based on what you think is capable of giving you the best value for your money. If you wish to invest in a Camco drinking water hose then the 50-feet Camco premium water hose will never cause any disappointment. One benefit of this water hose is that it is built to be extra tough. It also works well for your RV needs, and for camping, watering livestock, washing vehicle, gardening, and other applications. I think that Camco also prioritizes the user’s safety when manufacturing this drinking water hose as it is free of harmful substances, including phthalate, BPA, and lead-free. I like the overall durability of this hose, too. It is because it is around 20 percent thicker when you compare it to other standard hoses used for drinking. Such thickness allows it to resist pinholes and leaks. It also has reinforcement designed to maximize it kink-resistant ability. When used for drinking water, I am sure that you will also be happy with the fact that it does not cause any strong plastic taste. Another impressive benefit of this drinking water hose is that it has an added durability brought on by the machined fittings at the end constructed out of nickel-plated brass. Such material is known for its ability to resist corrosion while also offering relief against the strain. 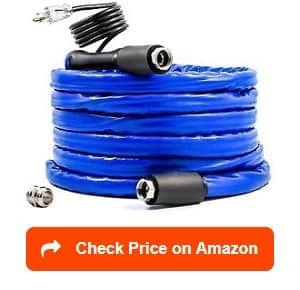 The fact that this water hose is UV-stabilized also guarantees that it has a longer life than the others. I noticed that the water hose is quite stiff during first uses, though but after some time, you can break it in. Another high-quality drinking water hose offered by Camco is the 25-feet TastePURE. 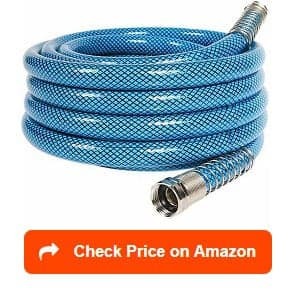 I love the flexibility of this 25-feet hose as it is fully functional in a number of applications and uses, not just for your RV and for camping. It is also designed to be useful when it comes to watering livestock, cleaning up your vehicle, and gardening. Constructed out of the highly durable PVC material, I am satisfied with the high level of safety and security this drinking water hose offers. The material is free of the harmful phthalate and BPA while also ensuring that the water that comes out of it does not have the unwanted garden hose taste. There is also a hundred percent guarantee regarding the safety of this water hose considering the fact that it complies with all the state and federal standards and laws in terms of using low lead in this product. Another great advantage is that it is highly reinforced, thereby maximizing its durability and kink-resistance. It is also stabilized to handle UV rays well, which gives its users a guarantee that it is long-lasting. 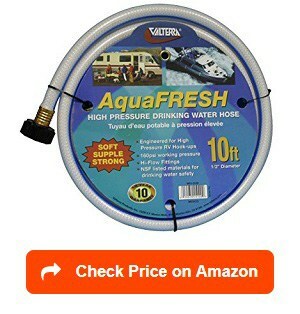 The length of this water hose is also considered to be just enough for the majority of RV users. One flaw to take note of, though, is that it generates a lower water pressure than 5/8-inch garden hoses because its width is not the same as the latter. Another of the potable water hoses designed for recreational vehicle use is the Teknor Apex NeverKink 8612-50. I am greatly satisfied with this product as it is known to be safe to use on all drinking water applications. It is mainly because it is lead-free while also complying with the safety standards in this industry. I also find it really suitable for recreational use, including marine and RV applications. It is greatly beneficial to users because it makes use of a patented reflex mesh technology. This technology takes advantage of a reinforced mesh network, thereby preventing tangles, kinks, and twists as much as possible. I am also happy with the overall flexibility of this hose. It is designed to be completely flexible, making it much easier to maneuver and handle. It also promotes ease when you attach it to the faucet because of its Thum Thing and ergonomic leak-proof coupling. One more advantage associated with this water hose is that it can protect itself from mildew and mold. It is mainly because of the MicroShield antimicrobial protection used in the product. Kinks can also be prevented at the faucet with the aid of its rigid sleeve. However, note that it is quite thinner when compared to other RV water hoses, making it prone to collapse when used around a tight corner. If you feel like a shorter hose will already suffice for your recreational needs then I highly recommend the Valterra W01-5048 Utility Hose. At 4 feet, it is definitely not as long as the other RV water hoses already reviewed earlier. Still, I find it more convenient to use because its shorter size also means that it is less bulky and more lightweight. With such length, I can easily carry it around and use it when I am camping or enjoying an RV trip. It is also fully suitable and safe when used for drinking water. It is non-toxic, which means that you will never have to worry about your drinking water getting contaminated with toxic substances. Another great advantage of this water hose is that it delivers a 160 psi working pressure, which is decent enough for most recreational applications. It also comes equipped with a user-friendly hose gripper, which makes the entire hose even more convenient to use. You will even find it convenient to use in filling your drinking water containers. The overall construction of this faucet is also flexible yet sturdy and firm. One major drawback, though, is that it makes use of plastic material for the faucet’s connector so it is vulnerable to leaking after some time of use. If you wish to invest in an RV and marine hose, which is less prone to kinking, then I think that the Teknor Apex 8602-75 water hose is perfect for you. One thing I really appreciate about this RV and marine hose is that it is lead-free while strictly complying with the standards in terms of lead content. With that in mind, I am sure that all users will feel safer and more secure when using the water hose as there is a guarantee that it is safe for drinking water. It is even constructed out of FDA sanctioned materials, further improving its safety when used on drinking water. Another positive benefit of this RV and marine hose is that it is constructed using the patented NTS reflex mesh technology. 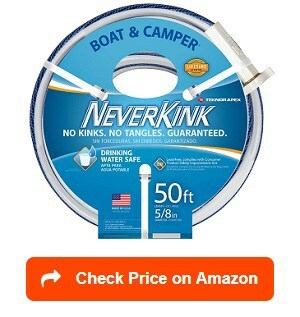 With this technology, you have a hundred percent guarantee that the hose will remain free of tangles, twists, and kinks. It also promotes a leak-free and easy attachment to your faucet because of its Grip-Tite coupling. Furthermore, I noticed that it is easy to drain. Coiling it back neatly in its storage area is also very convenient. I also highly recommend it because of its overall durability. It is even possible for it to last for years without diminishing its level of performance. One drawback, though, is that it makes use of subpar plastic material for the connector to the outside spigot or faucet. It would have been better if this is constructed out of metal. The subpar plastic material used for its faucet connector. Another drinking water hose that continues to leave a good impression on me is the Valterra W01-5120. 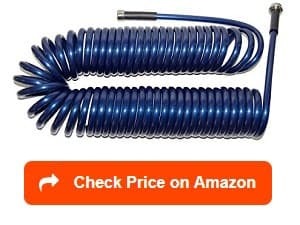 It is one of the most commonly mentioned products in several legitimate drinking water hose and heated RV water hose reviews because of its overall quality and efficiency. I am impressed with the FDA-approved and high-quality materials used in this water hose from Valterra because these materials just showcase how good and safe this product is. With its safe materials, I am one hundred percent sure that it is non-toxic and guarantees the continuous supply of safe drinking water. I am also glad that this water hose is made with high water pressure. It can supply up to 160 PSI working pressure. At 0.5-inch, this product is also capable of delivering a high burst pressure strength of up to 340 lbs. It also looks well-made and comes with just the right length that you can easily connect it to the water source. I also find it totally flexible while being convenient to roll up. It comes with long and useful black ties that you can use to easily coil it up conveniently in its storage area. It is capable of connecting to the water source well and carries safe drinking water without any unwanted taste. However, keep in mind that this product is not completely kink-proof, which is one of its drawbacks. I can also say that the Camco TASTEPure heated drinking water hose is worthy of anyone’s attention. It is one of the products from the brand that showcases a high level of durability and quality. 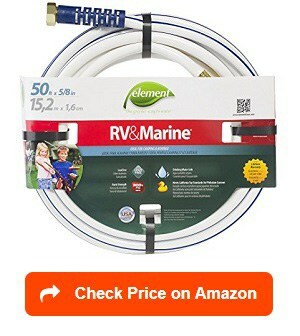 This Camco heated RV water hose actually comes at just the right length, around 25 feet. I also noticed how suitable it is to use in case you want to receive a high level of water line freeze protection. It even comes with an energy-saving thermostat, which allows it to deliver such protection with ease. The material used in manufacturing the hose is also devoid of any lead, phthalate, BPA, and toxic substances. With that, I can assure you that the water it supplies will not have any unwanted or harmful chemicals in it. It does not also leave a plastic and unwanted taste to the water. I am also impressed with its versatility as it is perfect for use on a wide range of applications, including RVs, kennels, agriculture, livestock, and commercial, residential, and industrial purposes. You will also find its sturdy exterior jacket truly beneficial as it has the ability to protect the electrical components and water hose from exposure to harsh elements and any possible damage. In addition, it has heavy-duty fittings plated to maximize its corrosion-resistant ability, making it as long-lasting as possible. The problem with this Camco water hose, though, is that it is that it is slightly bulky and stiff. Another product worthwhile for your attention is the Plastair SpringHose PUW650B9-M-3-AMZ drinking water hose. One thing I am really impressed with as far as this product is concerned is the fact that it is constructed out of a virgin-grade polyurethane material. Such polyurethane construction is actually a big help in making the hose capable of delivering safe drinking water. It is also sturdy enough, making it capable of resisting the possible harsh damages caused by the sun’s UV rays. The material is also tough while also having an abrasion-resistant ability. Another benefit I noticed in this water hose is that it has the ability to protect itself against the damages that might possibly be caused by kinking and overstretching. It has a coiled design, which I also find unique. It has a recoil memory in the sense that it is capable of extending and retracting based on its natural compact form. I also find the lightweight nature and the flexibility of this hose among its most favorable benefits. It ensures that you will not experience fatigue and too much stress using it. Furthermore, there is a guarantee of its ability to deliver a superior flow of water with the aid of its max-flow fittings, which also has anti-salt fittings. Note that it is a bit prone to leaking over time, though, because of the soft rubber material used in its O-ring. If you are looking for a really long water hose then the Element Marine and RV water hose will never cause any disappointment. It is long enough, up to 50 feet in length, so I am sure that it is capable of reaching the source of water in the campground no matter how far it is from your recreational vehicle. I am impressed with its high level of burst strength and flexibility as I find both these qualities helpful when it comes to camping and boating. 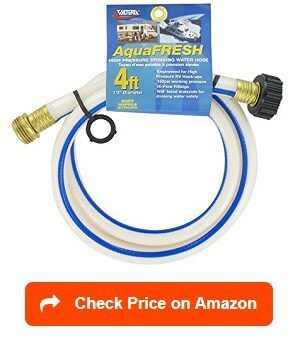 With its ability to resist kinking, I am also sure that this marine water hose works well whether you are on a boat, inside your RV, or in a campground. As mentioned earlier, it has a high and powerful burst strength. In fact, it is at 400 PSI. With such burst strength, I have an assurance that it can handle even bigger tasks when you are in your recreational vehicle or boat. What is even better about the burst strength of this water hose is that it also makes use of a patented hose armor technology, which makes it even more effective in preventing kinks from developing at the spigot. You can safely use it in a supply line for potable water as it is lead-free and phthalate-free. It can also guarantee long years of excellent and heavy-duty performance with the help of its sturdy couplings that are crush-resistant. One noticeable flaw in this water hose is that it seems to produce a chemical smell at first use. The last product that I am sure will leave a remarkable impression on anyone is the ClearFlow Garden Water Hose, which is also made in such a way that it is safe for potable and drinking water. The materials used in it, including the polyurethane nylon, gained the approval of the National Sanitation Foundation (NSF). Such offers a guarantee that it is capable of supplying fresh water without lead, toxins, or the harmful rubber elements. I also like the clear material used in it as it lets UV rays to pass through it, a big help when it comes to getting rid of bacteria and preventing the growth of algae. The crush-proof nylon fittings used in this water hose are also among the things that leave a good impression on me as I noticed that aside from being lead-free, they can also resist the risk of freezing. The fact that the water hose is lightweight also makes it more convenient to use in various settings, including indoors, marine, camping, and at home. Even with its decent 50-feet length, this hose is still known for its compactness. It is compact in the sense that you will have an easier time coiling and storing it. It also boasts of its high 90 psi water pressure. It has a drawback, though, and that is its vulnerability to yellowing after using it for a long time, especially if it gets exposed to the sun too often. Since buying an RV water hose requires you to examine and assess all your options critically, here is a short buying guide with some of the factors and key features that should be present in your ultimate choice. Do not forget to read reliable RV drinking water hose reviews, too, as such can provide you with details on making the soundest buying decision. The specific type of RV water hose you need – Note that RV hoses come in different types with each one performing a specific function. You have to figure out the specific hose you need since you can’t choose the wrong hose for a different purpose. The most common types of RV hose are the potable or drinking water hose, heated water hose, no-tangle or kink-free water hose, and the freeze protection water hose. In terms of the drinking RV water hose, you can’t decide to use your regular garden hose because it is not designed for drinking water. Note that the water you get from a garden hose is not the kind of water from your kitchen sink’s tap. It is primarily because standard hoses for the garden are usually constructed out of vinyl and rubber. In most cases, toxic substances and heavy metals are used to line them. To find the ideal hose for drinking water, go for one lined with polyurethane material. It is the safest material for the hose. Another option is the freeze-protected or the heated water hose, which you should choose, especially if you often go on a trip to places with below freezing temperatures. With such hose, you have an assurance that water will not freeze. 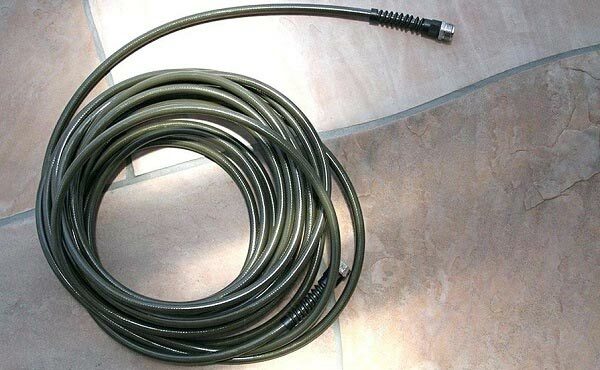 The tangle-free RV water hose should be created out of reinforced rubber instead of vinyl. Note that hoses made of vinyl are prone to kinking so you need to choose one based on a reinforced rubber to ensure that it is kink-free. The length of the hose – Before buying, it is also advisable to decide on the specific length of the hose that you need. Note that the most common ones are around 6, 12, 25, and 50 feet long. If possible, choose to buy water hoses that have various lengths. Such offers convenience, especially if you are still unsure about how far the source of water is from your vehicle. Also, ensure that the length is just enough to let you connect to the water source without straining the hose. Safety – Another crucial factor and quality you need to take into valuable consideration is the level of safety provided by the hose. This safety factor is all the more important, especially if you are planning to use the hose for drinking water. If possible, go for white hoses constructed out of materials approved by the FDA. What is good about these drinking water hoses is that they are completely lead-free and comply with the safety standards. Just make sure that once you purchase a white water hose, you do not hook it up to the grey or black water tank. Ability to avoid knots, tangles, and kinks – The most reliable water hose for your RV is also that which is less prone to kinking, tangling, and knotting. Remember that low-quality hoses are at risk of getting tangled, especially if you store them in a garage for a long time. With that in mind, find a hose, which is kink-free or tangle-free so it will not lie in knots. Aside from being kink-free, make sure that it also comes with a tight coupling. Such can help ensure that it will connect to the faucet without the risk of leaks, thereby preventing you from wasting water when turning on the tap. Flexibility – It is also necessary to scrutinize and assess the hose flexibility. Note that there are instances when it will have to pass through various corners and curves. In this case, you will find a flexible hose really useful as it lets you still have a good flow of water. Proper storage area – Before buying, it is also advisable to ask yourself first if you have enough and proper storage area for the RV water hose. You need to store the hose properly to increase its chances of serving its purpose for a long time. 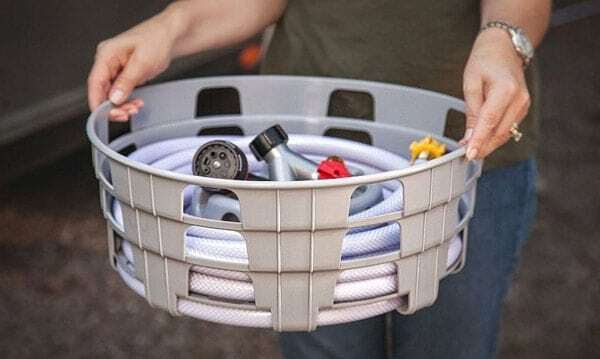 If possible, invest in a hose bag or reel, which you can use in storing the coiled hose securely and neatly. The proper storage area for the water hose is also that which protects it from the elements. This will ensure that the quality and life of the hose will be sustained for a long time. What is an RV Water Hose? Any camping or RV adventure checklist often comes with a water hose. Many already enjoy camping in an RV because this vehicle has comforts and conveniences that make the entire experience totally unforgettable and comfortable. One of the comforts associated with camping or enjoying an RV trip is running water. In this case, you also need to invest in the right RV water hose that will surely help you take full advantage of running water in your vehicle. This type of hose can fill your vehicle with clean water all the time. It is often white in color and usually comes in either flat or round style. 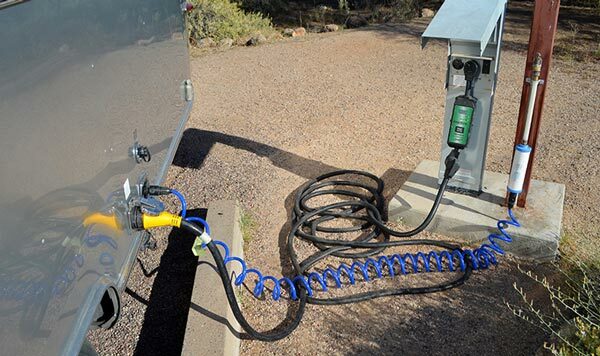 Some RV owners utilize multiple potable water hoses designed for recreational vehicles as a means of connecting their RVs into a source of water or water supply. For instance, you can connect a 4-feet water hose into a faucet. 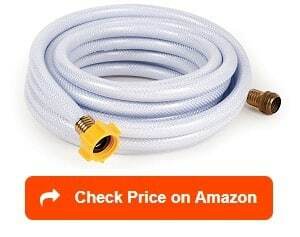 You can then expect this water hose to connect to the filter. After that, you can choose to add another water hose, which is longer than the previous ones, so you can make the water come close to your recreational vehicle. This is the starting point for connecting your water pressure regulator into the inlet designed for the holding tank. 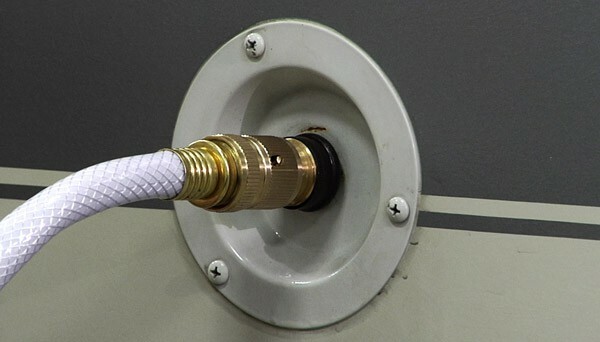 An RV water hose works effectively once all components of it are properly connected. It performs a simple function – that is ensuring that clean and safe water continues to flow into your RV. In most cases, it will start working once you connect it to an outdoor spigot. The connection process is quite simple. Note that the water hose often comes with two ends with different threading. One end comes with a cuff, which you can expect to fit over the spigot’s threading. This will let you tighten it, thereby ensuring that it will hold the water hose firmly into the spigot once you turn it on. The second end often has the opposite threading. It lets another water hose or one of the few accessories to be easily screwed into it. After securing the water hose into the spigot, the fiber or rubber material used in making it will be designed in such a way that it is adequately strong. Such strength makes it possible for it to hold the pressure of the water in case the other hose’s end comes with a sealed valve. If not, then you can expect the water to flow simply not only through the water hose but also out to the other end. You can also screw nozzles, valves, and any other attachments at the end of the water hose if you want to make some changes in the specific manner through which the water comes out. Basic valves let you control the amount and pressure of water that comes out of the water hose. The sprayers and nozzles, on the other hand, will alter the manner through which water comes out. This can range from high-pressure and tight streams to gentle trickles or showers. White water hose – As the name suggests, this water hose is white in color. It is specifically designed to let fresh water flow into your RV or coach. With its ability to carry fresh water, it is one of the most recommended water hoses for RV use. One advantage of the white water hose is that it provides a good supply of water, which tastes similar to the ones you have at home. You can expect it to supply such water provided the source is sanitary and clean and is not loaded with chemicals. RV drinking water hose – Based on its name, it is safe to assume that this water hose is ideal for use for your vehicle’s drinking water. It is designed in such a way that it keeps your drinking water free of harsh elements and contaminants that might pollute it. What is good about this drinking water hose is that it is usually constructed out of high-quality and sturdy materials. With such materials, you can rely on its ability to last long. This type of water hose is also known to be totally safe for use on drinking water. Heated water hose – This specific type of RV water hose is constructed specifically for the purpose of providing heated water. Just like other kinds of hoses designed for RV use, the heated one is also constructed out of FDA-approved and high-quality materials. This hose also features a heat strip, which you can usually find along its side. You can plug this strip into the standard 110-volt electrical connection if you want it to perform its function of heating up water. It stays above freezing point, so you can expect the water that flows in the hose to also stay beyond the freezing point. It is also possible for the water to flow freely into your vehicle. Potable water hose – You can also find a water hose for RVs that is specifically designed for potable water. What this specific type can do is to aid you in washing your vehicle or boat among many other special purposes. This product is also designed to be free of BPA, phthalate, and lead. 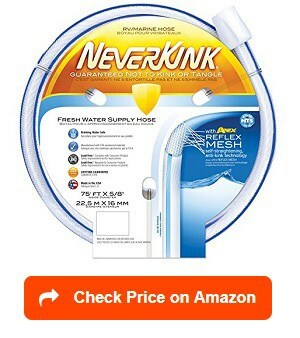 Kink-free and tangle-free water hose – You can also choose to invest in an RV water hose, which is guaranteed to be free of tangles and kinks. In most cases, it is constructed from a reinforced rubber, which can resist kinking and tangles. It is an excellent choice for those who do not want their hoses to kink constantly as it might just reduce its service life. Aside from being free from kinks and tangles, this hose can also prevent twisting. Flat water hose – This type often comes in a reel, which you can simply unwound when necessary then wound back up so you can store it neatly. The flat water hose also needs to be fully unwound before you can use it. With that in mind, it is necessary for you to consider its length before buying. A lot of people may wrongly assume that driving an RV only appeals during the summer months. This is not the case, though, as recently, millions of people have made it a trend to drive and use their RV all year round. Promotes safety – Ensuring that you have a dependable water hose in your recreational vehicle promotes less hassle on the road while also helping ensure your safety. Your safety is also prioritized, especially if you decide to stay in steep inclines or around rocky grounds. No matter where you are, you know you will have a constant access to safe water. Versatile – I can also say that the RV water hose is completely versatile. Aside from giving you a constant supply of safe and clean water, it is also possible for you to use it for a number of other purposes. These include washing your vehicle or equipment and getting a constant supply of hot water. Ensures that you will have great-tasting water – Due to the ability of this water hose to give you clean and safe water, it is also safe to say that it can improve its taste. This is a good thing for RV owners and users like you because how good the water in your vehicle tastes can greatly improve the quality of your life on the road. It is possible for you to get such water especially if you decide to invest in a no-freeze water hose for RVs. It is because this hose is known for meeting the highest standards worldwide regarding clean and safe water. You have an assurance that it is perfectly useful for drinking water and ensures that it does not come with any weird taste. The benefits of having an RV water hose do not end on the ones already mentioned. One more thing that is so good about it is that it is cost-effective. You might think that having it around is expensive but the truth is, the cost of owning it is too low. You would not also have a difficult time finding a water hose that fits your budget. As mentioned earlier, having a constant supply of safe and clean water is crucial for all RV owners and users. This is especially true if you live in your vehicle for a long period of time and in different locations. However, you need to remember that the water pressure in some RV parks and campgrounds are not completely safe and consistent all the time. If you constantly hook and unhook your water hose then it is greatly possible for it to add wear and tear to your system. Water Regulator – Typically, this attachment is something that you can screw into the spigot. The hose can then be screwed into your regulator. One of the major functions of the water regulator is that it prevents damage to the plumbing system of your recreational vehicle. Note that this damage might be caused by high water pressure. Water regulators are necessary because most RV campgrounds and parks differ in the amount of water pressure that comes from their systems. Recreational vehicles can only handle a specific amount of water pressure. The recommended water pressure, in this case, is around 50 to 60 pounds per square inch (psi). The good news is that there are several types of water regulators today, thereby promoting ease in making your choice. Some water regulators are designed in such a way that you can manually adjust the pressure. Others, on the other hand, are set based on a certain water pressure. Your water regulator will also list the max water pressure that it can handle on the packaging or the device itself. Just make sure that you properly maintain the regulator as there are times when salt and calcium buildup happens. One sign of this buildup is an excessively low water pressure. To handle this, just soak the water regulator in vinegar for a few hours. You can then rinse it and screw it back on. Hose Elbow – Another vital attachment for your RV water hose that will surely maximize its performance and benefits is the hose elbow. One opening of this attachment can actually attach to the recreational vehicle. It does so with the help of the water intake port. Your hose can then be vertically screwed into an L-shape connector. Avoid screwing it horizontally to eliminate the possibility of adding too much stress and potential damage to the fitting. Screwing the water hose vertically is also helpful in extending its life. Hose Splitter – This specific attachment will start to work once you screw it into a spigot. What is good about this splitter is that it lets you connect multiple water hoses simultaneously. You can expect the switches to open and close it when needed. In case you need to rinse something, bathe your pet, or do any other task that requires you to use a second water hose, the hose splitter can be expected to work without having to detach your fresh water hose and use it. In addition, because you do not need to drink from the second hose, you can use it without having to be extremely careful with the way you are using it. Aside from investing in the mentioned attachments, it is also necessary to store the water hose securely. This will prevent it from getting contaminated. One tip when it comes to storing it is to fix its ends together. By properly storing it, you get the chance to maintain its proper functioning, maximize its benefits, and enjoy it for quite a long time. What is the difference between a drinking water hose and a garden hose? A drinking water hose and a garden hose are two different products. That said, you can never use a garden hose as a replacement for a drinking water hose. The difference between the two can usually be seen on the materials used in them. A garden hose is often constructed out of materials containing lead or any other elements that are unsafe for consumption. The hose specifically designed for drinking water, on the other hand, does not contain the mentioned elements so you will see it is rated as safe for use on drinking or potable water. A garden hose is also usually not strictly regulated while the one designed for drinking water needs to follow strict regulations before it can be introduced to the market. Can I use a drinking water hose as a garden hose? Yes, you can use a drinking water hose as a garden hose provided it comes at the length that makes it very convenient for you to use it in your garden. However, if you have a garden hose then you can’t use it as a hose for your drinking water unless there are really legitimate certification and proof that it is indeed safe for that purpose. It is mainly because standard garden hoses usually have toxic chemicals in their materials, like phthalates, BPA, and lead that are unsafe for humans and animals. Can you use a drinking water hose with hot water? The answer is actually dependent on the brand and the model of the hose. Note that standard drinking water hoses are capable of withstanding maximum temperatures of 100 degrees Fahrenheit. 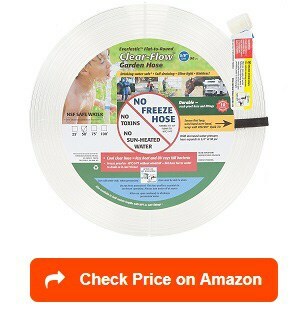 If you think that the water temperature that your hose will get exposed to is hotter than that then make it a point to look for a hose specially designed to handle hot water. However, take note that the majority of hot water hoses are designed for commercial purposes so they are either suitable or unsuitable for drinking water applications. Can I use the drinking water hose to drain my water heater? When planning to drain your water heater, the most suitable type of hose is the garden hose instead of the one used for drinking water. If you own a water heater then you are probably aware of how important it is to drain it at least annually to extend its life. It is because draining works in removing the buildup of sediments inside. You can’t use a drinking water hose for this purpose, though as you have to avoid letting your drinking water come into contact with the mentioned sediments. In this case, you can make use of a garden hose for the draining purpose. What is the water pressure (PSI) rating of an RV water hose? This is again dependent on the brand and manufacturer of your chosen RV water hose. In most cases, though, the normal water pressure (PSI) rating often used for this water hose is around 40 to 70 psi. That would be more than enough pressure for your drinking water. Is the water hose lead or BPA-free? Yes, most of the water hoses designed for recreational vehicle use are free of lead, BPA, phthalates, and any other harmful and toxic substances. Such feature especially holds true if you are planning to invest in a drinking water hose as this product needs to adhere to the specific safety standards set by the government. What is the RV water hose made of? The safest RV water hose for you is that constructed out of FDA-sanctioned materials. The hose should be lead-free, which complies with the standards set by the government in terms of safety. In most cases, the safest materials used for the water hose is the international-listed polymer and polyurethane as both are known to not be leached with toxic and harmful substances. Is the RV water hose made in the USA? Most high-quality RV water hoses are actually made in the USA. Such hoses also make use of materials approved by the FDA to ensure that they are free of lead and other toxic substances. Water hoses made in the US are also known for complying with the federal and state laws regarding lead levels, thereby guaranteeing their safety. Undeniably, you have numerous options when it comes to searching for the best RV water hose – that is why you really have to spend time observing your options and gathering information about each one. Note that the quality and features of each hose can have a great impact on ease of use and lifespan. If possible, choose one, which is long-lasting. It should serve its purpose for around 5-10 years. In addition, it should be less prone to rotting, cracking, and leaking. Look for a more cost-effective option by carefully scrutinizing its quality before buying. We would like to thank you for reading this article. Find out more about how to choose the best RV water pumps, best RV water softeners, best RV tankless water heaters and best RV water pressure regulators with our reviews and ratings. Furthermore, please take a look at the best RV water filters and best RV shower heads, to choose the best one for your RV freshwater systems.